Across the past 50 years, anterior cervical discectomy and fusion (ADCF) has been the gold standard surgical intervention for cervical radiculopathy and myelopathy that is unresponsive to conservative treatment. For the past 15 years in Europe and more recently in the United States, orthopedic and neurosurgeons have sought to determine if disc arthroplasty is a viable alternative to fusion. By mimicking the natural anatomy of the cervical spine, surgeons seek to avoid some of the risks and complications inherent to cervical fusion. The development of prosthetic intervertebral discs evolved out of the success of hip and knee arthroplasty, now standard treatment for severe degenerative changes of the knee and hip joints. The goals in designing prosthetic discs include establishing an axis of rotation that promotes normal kinematics, maintaining or restoring the normal range of motion and disc height, and transmiting loading forces through the vertebral bodies in a natural fashion. While the incidence of degenerative disc disease and spondylosis are high, the vast majority of people require no surgery. They may be asymptomatic or their symptoms may be mild. Additionally, few patients meet the strict criteria for eligibility for disc arthroplasty. Fusion remains far more common. Contraindications to total disc arthroscopy include osteoporosis, spondylolisthesis, bone disease, facet joint abnormalities, instability, prior laminectomy, RA, ankylosing spondylitis, ossification of the posterior longitudinal ligament and diffuse idiopathic skeletal hypertosis.3,5,6 Patients with these conditions are better candidates for ACDF or another intervention. In designing an artificial disc, the goal has been to recreate the natural function of the cervical disc as closely as possible. Artificial discs approved for use in the United States have some variation in design and classification. Materials are metal alloys designed to last a lifetime, thereby preventing the need for second replacement surgeries. Patients remain in the hospital for 24 to 48 hours after surgery. They are sent home with few movement restrictions. After two weeks, patients are permitted to perform mild flexion and rotation activities.5 Extension is initiated after the incision has healed.5 Rehabilitation is similar to fusion, but recovery and healing occurs in shorter time. The primary goals of physical therapy are to promote good healing of scar tissue and to prevent adhesions, institute good posture and body mechanics, maximize range of motion and to address any strength deficits in the neck. Total disc arthroscopy is relatively new and there is a lack of research regarding postsurgical physical therapy. In addition to a lack of research regarding rehabilitation following cervical disc arthroplasty, there is no evidence to support the use of modalities as adjuncts to physical therapy. Searches of PubMed, Proquest, Cinahl and Google Scholar using search terms such as, “artificial cervical disc”, “cervical disc prosthesis”, and “cervical disc arthroplasty” failed to uncover any published research. Since the advent of cervical disc arthroplasty is relatively recent, research continues to focus on determining the benefits of cervical disc arthroplasty in comparison to cervical disc fusion. 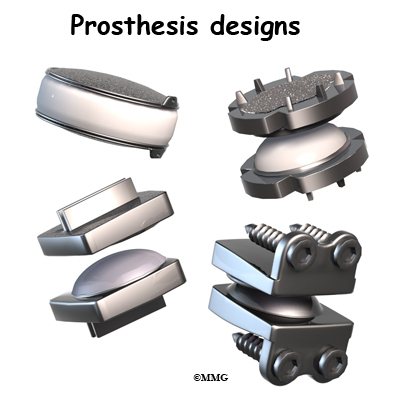 Other research concerns individual prostheses or surgical methods. For related information, please refer to the Morphopedics pages concerning Mid-cervical Disc Fusion and Cervical Disc Herniation. While potential treatment methods may overlap, there may be contraindications to the use of ultrasound or electrical modalities due to desired location of application, the materials in the prosthesis or impaired sensation surrounding the site of surgery. While cervical disc arthroplasty has been performed in Europe for the past 15 years, it was approved in the United States only since 2007. At this point, studies are largely short-term, with the longest following patients for 4-6 years. Studies generally compare outcomes for patients receiving artificial discs with patients receiving fusion because fusion has been the gold standard. HO is a frequent complication of the surgery, with figures ranging from as low as 17.8% to as high as 76.2% across several studies.15 Several studies show high rates of HO and a correlation between HO and restricted range of motion.6 Rates of HO occurrence differed by prosthesis type, possibly due to design, metal debris from wear or bone dust from endplate drilling.15 HO can be triggered by a trauma, such as surgery, and originates from osteoprogenitor stem cells lying dormant within affected tissues. Foundations for Physical Rehabilitation. Philadelphia, PA: Mosby, Inc.; 2002. 2. Sakalkale DP, Bhagia SA, Slipman CW. A historical review and current perspective on the intervertebral disc prosthesis. Pain physician. 2003;6(2):195. 3. Jaramillo-de la Torre JJ, Grauer JN, Yue JJ. Update on cervical disc arthroplasty: where are we and where are we going? Curr Rev Musculoskelet Med. 2008;1(2):124. 5. Rodts MF. Total disc replacement arthroplasty. Orthop Nurs. 2004;23(3):216. 6. Kang K, Lee C, Han J, Chung S. The factors that influence the postoperative segmental range of motion after cervical artificial disc replacement. Spine J. 2010;10(8):689-696. 9. Jawahar A, Cavanaugh D, Kerr E, Birdsong E, Nunley P. Total disc arthroplasty does not affect the incidence of adjacent segment degeneration in cervical spine: results of 93 patients in three prospective randomized clinical trials. Spine J. 2010;10(12):1043-1048. 11. Kim S, Paik S, Castro PAF, et al. Analysis of factors that may influence range of motion after cervical disc arthroplasty. Spine J. 2010;10(8):683-688. 12. Grob D, Porchet F, Kleinstck F, et al. A comparison of outcomes of cervical disc arthroplasty and fusion in everyday clinical practice: surgical and methodological aspects. Eur Spin J. 2010;19(2):297-306. 14. Zechmeister I, Winkler R, Mad P. Artificial total disc replacement versus fusion for the cervical spine: a systematic review. Eur Spin J. 2010. 15. Yi S, Kim K, Yang M, et al. Difference in occurrence of heterotopic ossification according to prosthesis type in the cervical artificial disc replacement. Spine 2010;35(16):1556-1561.